. However, our existing JSON format isn’t perfect. It is very much an automatic translation from our Atom format and as a result it is very wordy and lacks the elegance that a native JSON dialect would offer. It also supports only read operations. We have made our new JSON implementation cleaner, simpler and closer to what you would expect from JSON. For example, the long XML namespace prefixes are no more, and we've removed many pieces of metadata specific to Atom documents that come across as noise in JSON, making it easier to parse. In the example above the body of the request is 59% smaller in JSON-C than in Atom. If you use gzip compression, the saving is still 37% of the size of the Atom body. This could make a big difference in mobile or other bandwidth-constrained environments. For the request above, the body of the response is 53% smaller in JSON-C than in Atom - 30% smaller when using gzip compression. To learn more about our new JSON-C format please read our updated Developer’s Guide. Have fun! It’s been almost four years since the Calendar API has supported the JSON format. However, our existing JSON format isn’t perfect. It is very much an automatic translation from our Atom format and as a result it is very wordy and lacks the elegance that a native JSON dialect would offer. It also supports only read operations. Editor's Note: This post was originally published on the Google Enterprise Blog. 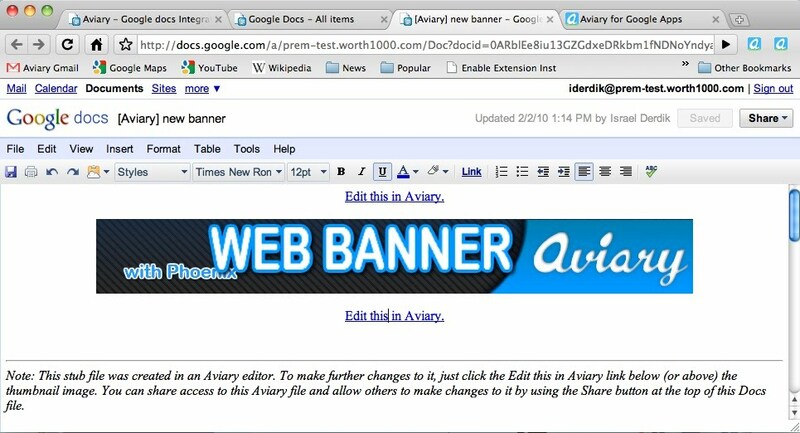 We decided to re-post it here as we think it'll be interesting to readers of the Google Apps Developer Blog. for more information on supported countries, and watch this blog or sign up to our email announcement list to be notified of changes. As a reminder, our Marketplace payment policy launched with a revenue sharing exemption period, which lasts until 3 months after the release of these billing APIs. Upon expiration, all installable apps sold through the Marketplace are required to integrate with these billing APIs and bill new customers acquired through the Marketplace exclusively through these APIs. However since our seller country list is may be smaller than the list of countries where our vendors are located, we have updated our payment policy to extend the revenue sharing exemption period until 3 months after it is released in a country where you are located. Put more concretely, if you are a Google Apps Marketplace vendor located in Australia or India or any other country not currently on our seller list, your revenue sharing exemption period remains in effect until 3 months after the billing API supports your country. We encourage you to read the payment policy in full to make sure you understand it, and consult our FAQ for more information. Note that the availability of the revenue exemption, including the determination of where a developer is located for purposes of the exemption, is entirely at our discretion. Since launching the Apps Marketplace back in March, we’ve been heads down working on our Marketplace billing API, which is based on Google Checkout. The goal of the API is to make it easy for Marketplace vendors to sell their installable applications to Google Apps customers, using either a subscription model or one-time payment, and accommodating both free trial and freemium pricing plans. We are excited to get it in to developers’ hands. Our current plan is to release it in Q4 for US sellers, and then expand to other seller countries in the following months. Please see our FAQ for more information on supported countries, and watch this blog or sign up to our email announcement list to be notified of changes. at the right times can make all the difference in converting users into productive and happy customers. One of the first opportunities to engage users is when they’re installing your application. With a simple additional <link> in your manifest, you can easily alter the installation flow and bring the administrator to your site while you have their attention. This is the perfect time to gather whatever information your application requires before basic functionality can be enabled, particularly if that information is best handled by an administrator or business owner. Let’s take a look at how we would build this out with our SaasyVoice demonstration application we wrote for our talk at Google I/O. Here’s a quick mockup of what an administrator would see when they click through to setup the application. There are a few important things to point out here. We want to keep administrators focused and guide them through the setup so they complete it the first time through, so it helps to set expectations up front. We still need to ask for some information about the company, but we want to be careful not to ask for things we can otherwise discover for ourselves. To get information like the administrators name and email address, we simply authenticate them with OpenID prior to displaying the page and ask for the attributes we need. During this step of the install, its helpful to guide the administrator through properly configuring the app for the end users. 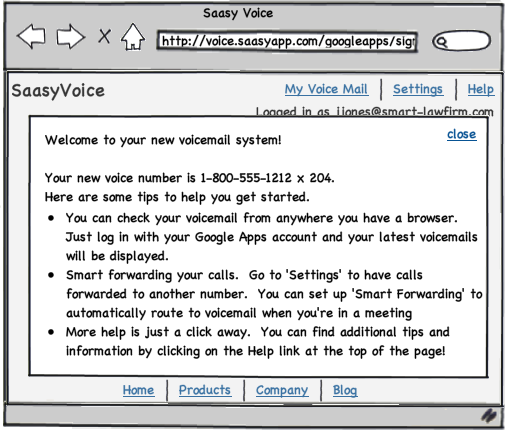 For some applications, this could be assigning the appropriate roles to managers and employees or, in the case of SaasyVoice, assigning the user a phone extension. To accomplish this, Marketplace Apps can take advantage of the provisioning API to discover user and groups for a domain and learn which users are privileged administrators. Administrators need to do more than just install the application on their domain. Notifying and providing users with the knowledge needed to use the application effectively can be a challenge. Using the same data from the provisioning API, we can help admins get their users up to speed by sending instructions to each user. Of course we want to be good email citizens too and not email users without the administrators consent. It’s important to remember that this is all happening within the context of the Marketplace’s installation process, and it’s important to return the admin back to Google Apps to complete the process and enable the application for their domain. Give administrators too many choices or too much freedom and there’s a good chance they’ll fall out of that process and leave the application inaccessible to users. We’ve covered things well from the administrators side of things, and we were able to help them set up the application quickly by taking advantage of the integration options and data available to us. The last piece to the puzzle is making sure users have an equally positive experience. 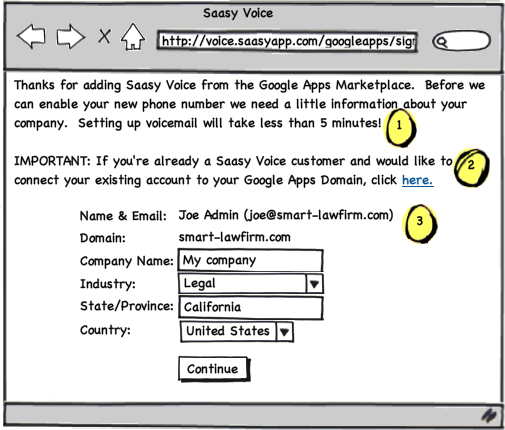 Applications that create accounts on demand can use many of the same techniques to minimize setup time for each user. We can also take advantage of a user’s first log in to display important messages and tips to help them get started. While the examples here are just mock ups, many apps in the Marketplace have already adopted these and other techniques. Our integration guide on code.google.com has a few examples, or you can try out some apps for yourself in the marketplace. More importantly, developers have learned that investing the time and resources to craft a great first experience for their apps pays off. Stay tuned for the next in this series on Google Apps integration best practices! 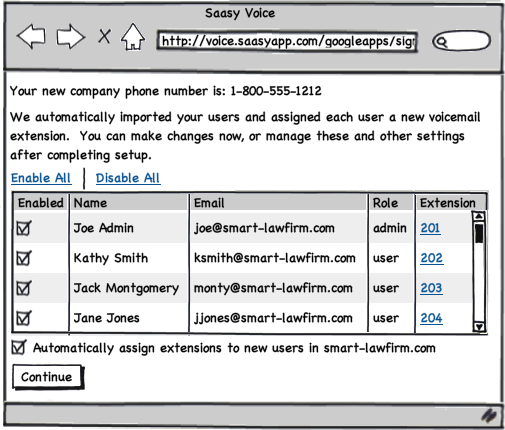 This is the first in a series of posts looking at the varied integration options with Google Apps and the Google Apps Marketplace. With that in mind, what better place to start off than users’ first experiences with your application -- the initial setup and login process. The more work an application requires just to get started, the more opportunities there are for administrators and users to abandon the application and try something else or give way to complacency. Yet simply thrusting users into an app with no help to get started can be equally as frustrating. Finding the right balance can be tricky, but giving users the right choices at the right times can make all the difference in converting users into productive and happy customers. and OAuth for Web Applications are designed for this purpose. However, the behavior and look and feel for each is slightly different. Both ultimately allow the user to grant your application access to their data, but knowing the differences helps you make the best choice. Here is an article that covers the topic and should help you choose. It has color coded highlights that compare the two. Again there are different options for choosing Google Data authentication from a Gadget container. The first option to consider is OAuth Proxy for Gadgets. OAuth proxy is a 3-legged dance asking the end user for permission to access their data. Once access has been granted then the gadget developer can use the gadgets.io.makeRequest()method to make the Google Data API calls. Most likely you will want the JSON response from the feed so remember to add the ?alt=json URL parameter. For more information and code examples on OAuth Proxy see Writing OAuth Gadgets. For Marketplace Gadgets another authentication option is available and uses OpenID. This option is used to authenticate the user and determine identity only and it does not provide authorization for API access. After the user is authenticated, server-to-server calls are used to make the requests, authorized via 2-legged OAuth and specifying the xoauth_requestor_id based on the authenticated user from OpenID. For more information on this approach see the Marketplace Best Practices page. Adding layers of security is a common approach to to making data more secure. 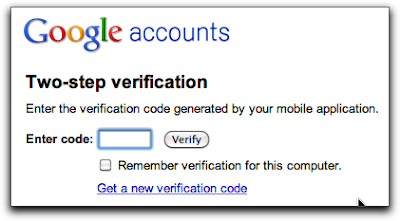 Google does provide various layers by providing different authentication and authorization methods. Registering web applications, supporting digital certificates, support for industry standards, (SAML, OAuth, OpenID) all help in providing security. However, one of the most common mistakes we can make is not taking care to protect important credentials. When working with Google Data ClientLogin and 2-legged OAuth, these credentials can be keys to the kingdom (e.g. administrator credentials or domain OAuth consumer secret) and therefore should be protected at all costs. 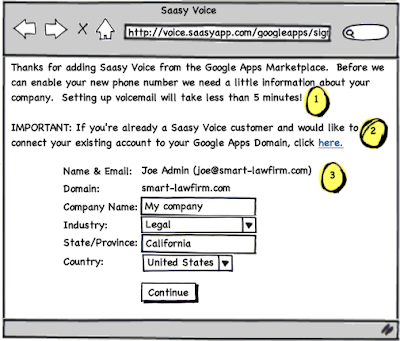 Access to these credentials can potentially open the entire Google Apps domain data for the authorized services. This could have tremendous impact especially if you are maintaining 2-legged OAuth credentials for domains that have granted your application access, e.g. a Marketplace application. Therefore it is risky practice to embed them in source code or even a configuration file. Consider using an approach that allows you to enter credentials at runtime and store in memory or use your favorite method for secure storage of these important credentials. With the March announcement of the Google Apps Marketplace, the decision making process may have become a little easier. OpenID+OAuth and 2-Legged OAuth are the schemes that are supported and likely will be used if your Marketplace application needs access to Google Apps data; which is very likely. You’ll notice that the Marketplace has embraced the open standards of OpenID and OAuth. While AuthSub and ClientLogin are proprietary to Google, they will likely not be useful in your Marketplace application. If your application needs to create or make modifications to user accounts (using the Provisioning API) then your only current option is ClientLogin. But a common oversight is to not reuse the access token. Without proper reuse of this token, eventually your application will force the account into a CAPTCHA state which can easily be avoided if the access token is used for subsequent ClientLogin authentication requests. It is best to keep this token cached in memory and renew the token in some configured frequency/timeout. This post covered some important considerations for selecting a Google Data authentication method for your application. If you are new to Google Data authentications and want to have a better overall understanding then start with the Getting Started with Account Authorization guide. No matter which approach you choose make sure that accessing users data is done is a secure user friendly way. Google Data authentication is a vast topic. For your convenience here are a list of resources. Editor's Note: Jeff Morgan is a Senior Technical Consultant at Appirio, a cloud solution provider which creates products and delivers services . He’s worked with many Google Data APIs, so we’re excited to publish his insights on the various authentication choices. As developers using the Google Data APIs, one of the first challenges we tackle is learning and sorting through the Google Data authentication schemes. AuthSub, OAuth, ClientLogin, OpenID+OAuth, and so on. Perhaps you may be developing a Google App Engine web application for the first time and want access to a user's Google Calendar. Maybe you are building a data processing application that requires access to a Google user's data. If you are familiar with the Google Data APIs you likely know that there are many authentication options available depending on the API. So how do you decide? 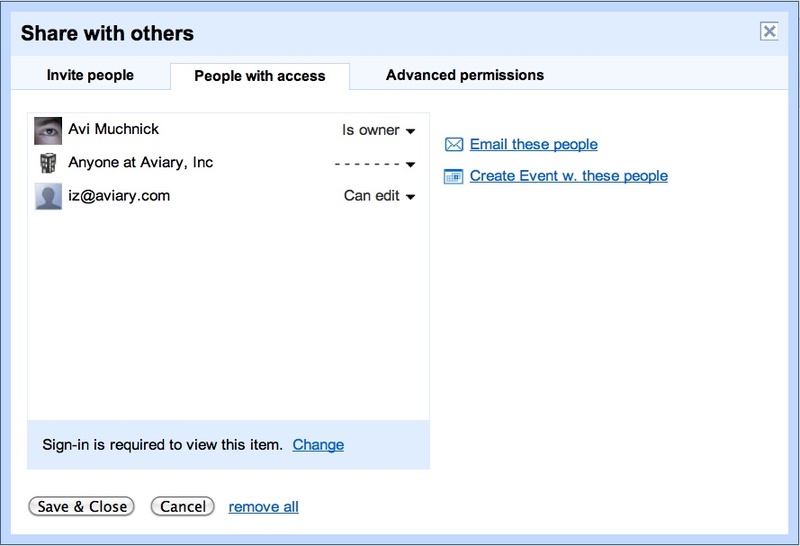 The best place to start is the Getting Started with Account Authorization guide. Also, the Authentication in Google Data Protocol page provides detail on the various authentication methods. This post provides references to many existing resources and some additional things to consider to help you decide which authentication method to use for your application. 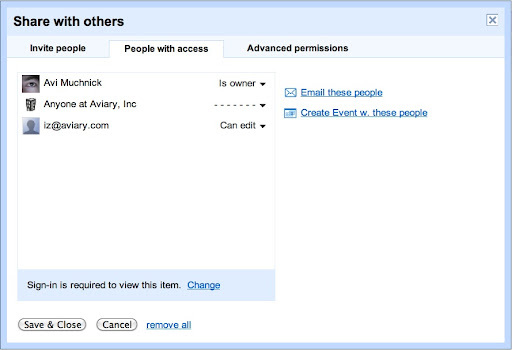 Does your application need end user permission to access their Google data? When developing web applications, developers are sometimes faced with deciding between AuthSub or OAuth. However, the first question should be, "Who will be granting permission to the user's Google data?" 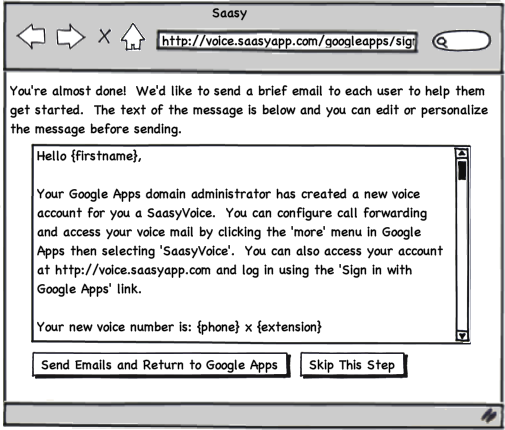 If the end users are Google Apps users then most likely it will be an administrator granting access. Frequently developers ask the same question in another way, "Should I use 3-legged or 2-legged authentication?" 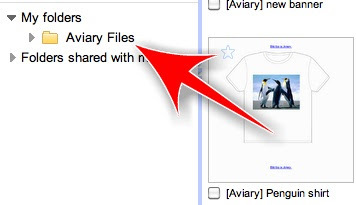 Ideally, from a Google Apps user experience perspective, it is better to use 2-legged OAuth. 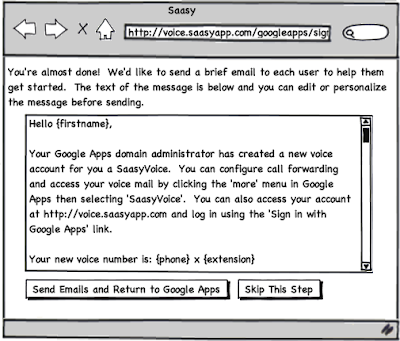 This way the application is granted access to a user's Google Apps data at the administrator level. The end user can start to use the application and the trust has already been established by an administrator. If you are developing a Marketplace application then it is very likely you will not need to engage in the 3-legged authentication dance. However, if you are writing an application that is wide open to anyone with a Google account, let the 3-legged dance begin. Both AuthSub and OAuth for Web Applications are designed for this purpose. However, the behavior and look and feel for each is slightly different. Both ultimately allow the user to grant your application access to their data, but knowing the differences helps you make the best choice. Here is an article that covers the topic and should help you choose. It has color coded highlights that compare the two.